A blog giving an analysis of the CAG audit reports. It also highlight cag audit scam. 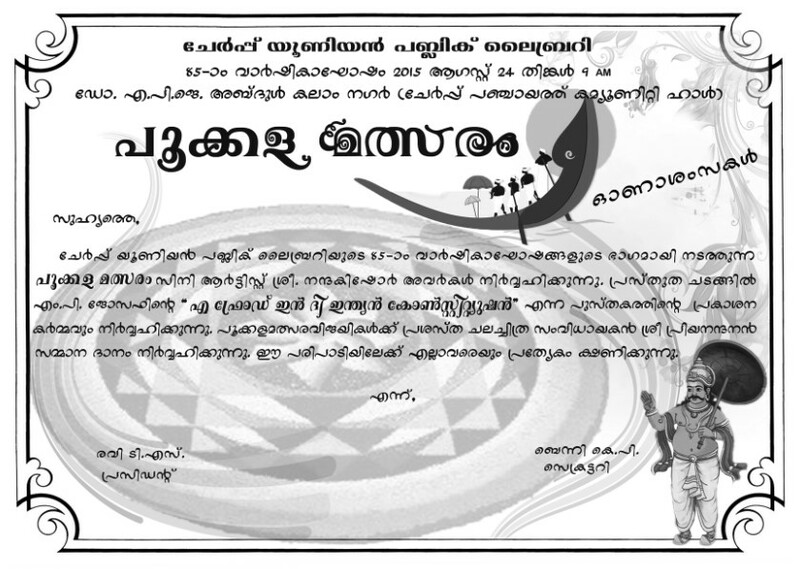 F. P.I.Kakku & Son, Municipal Office Road, Thrissur – 680001. Fort Road, Plaza Jn. Kannur. From the public releasing ceremony of the book "A FRAUD IN THE INDIAN CONSTITUTION"
The book ‘A Fraud in the Indian Constitution’ written by Shri M.P. 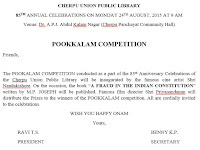 Joseph was publicly released by the Chief Guest Shri Nandakishore (Cine Artist) in a public meeting held on the occasion of 85th Annual Celebration of the Union Public Library & Reading Room, Cherpu on 24/08/2015. Meeting was presided over by the President of the Managing Committee of the Library, Shri Ravi Cherpu. 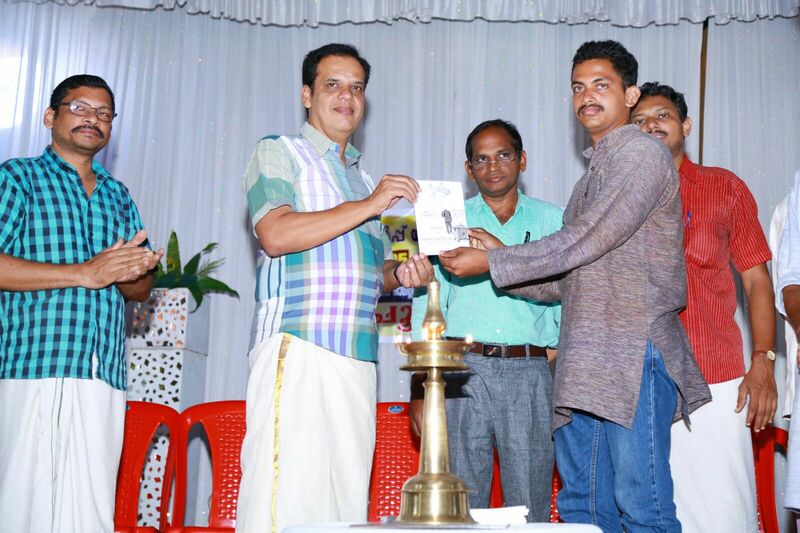 Seen in the Photographs are Shri Jenson Joseph handing over the book for official release to the Chief Guest. 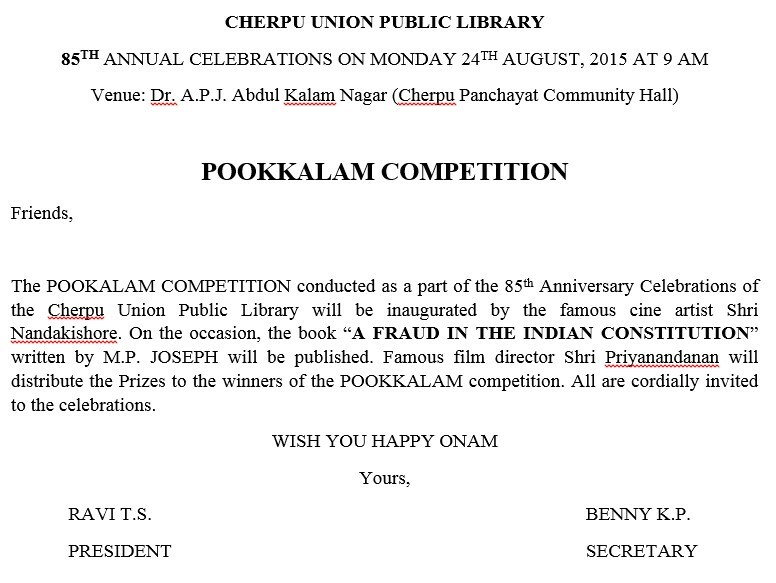 Later the President received the book from the chief guest on behalf of the Library. 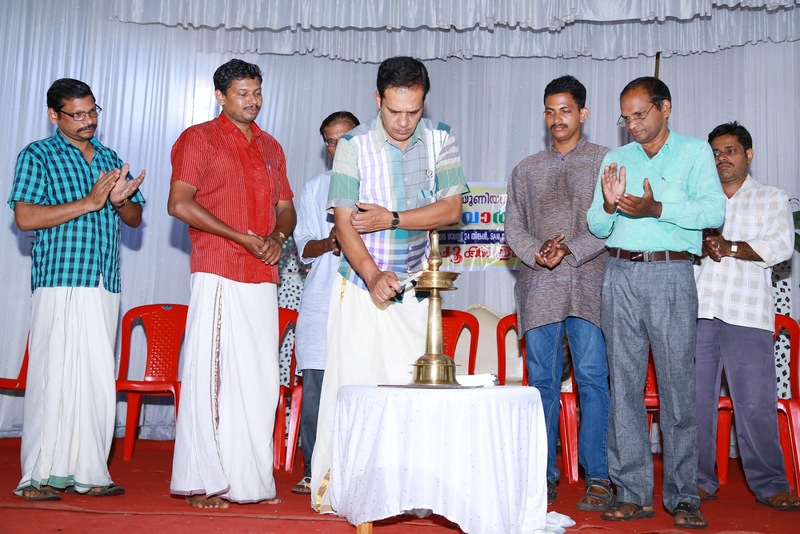 Shri Surendran Perinchery also made an introductory speech about the book for the benefit of the audience. 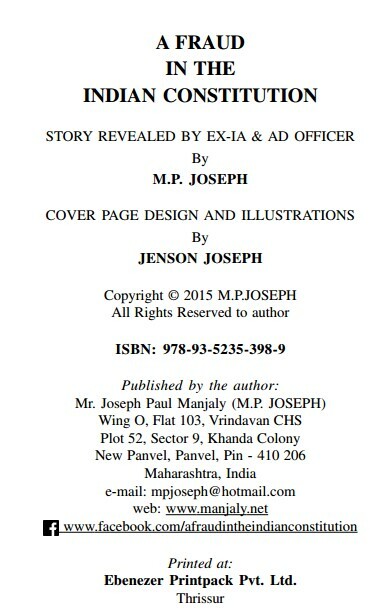 The book is in the form of an autobiography/memoirs of the author M.P. JOSEPH, who is a voluntarily retired official, ahead of more than 5 years from his regular retirement, from the INDIAN AUDIT AND ACCOUNTS DEPARTMENT (IA&AD) headed by the COMPTROLLER AND AUDITOR GENERAL OF INDIA (CAG) as Senior Audit Officer. The very purpose of writing this book is intended to give the public a true picture of a constitutional institution namely the Comptroller and Auditor General of India commonly known as CAG – i.e., how this institution is being misused by itself, by the Government Officials, by the Politicians and other interested parties. This is quite contrary to the image what is projected in the minds of the public through public media instigated by these interested parties to achieve their own selfish goals. This book is a real insider story. The part I of the book starts with the Heading “CAG NOT EVEN AN ACCOUNTANT”. dismissing a Public Interest Litigation (PIL) based on an audit objection (Draft Para) reported by the CAG in his Audit Report submitted to the Parliament. Thereafter he narrates from his own experience how the CAG manipulates the Audit Report. From chapter 6 to 10 he narrates how he was harassed by the administration for fighting against this kind of audit manipulations. To keep the originality of the incidents, he kept the original correspondence from the charge sheet till the decision of the review petition to the CAG of India. He also narrates how he continued with further exposure of Audit Scam undeterred with the action taken by the administration against him. In part III captioned with ‘after crucifixion and resurrection’ he narrates how he started applying the tools under the ‘RIGHT TO INFORMATION ACT 2005’ to fix the CAG and the Ministry who played drama to fool the Nation by submitting inflated and fake audit paras/objections (Draft Para). The book is ending with, “Is it not both CAG and the Ministry is fooling the Parliament and thus the people of India? Now it is for the Public Accounts Committee (PAC) of the Parliament to tell the Public what they are doing with these kinds of audit objections and replies brought before them” by the auditor CAG and the auditee Ministries.